Contra City Online : Are you a fan of 3D shooter games? Grab the weapon and fight online with millions of players all over the world in new online FPS Contra City. Choose the equipment you like among the variety of outfits. 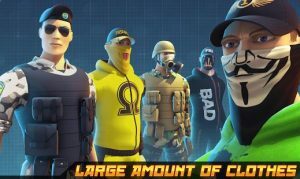 You can look like commando, gangster, military, raper, biker and dozens of other characters. Show everyone who is the boss of the city! Variety of modern weapons: Katana, Desert Eagle, Kalashnikov AK47, Minigun, Rocket Launcher and Flamethrower. Also hand gun, assault rifles, gatling guns and even Golden weapons and bullets for real pro players! Different outfits: hats, masks, camouflage. Equipment sets with bonuses. Improve your character’s talents in Gym and make him undefeatable. Get new interesting tasks every day and receive the rewards! Invite your friends and find the new ones. Compete with your friends and show your skills. Join a clan or create your own one. Chat with your clanmates and improve your clan together. All your friends and clanmates will see your progress and achievements! Fight counter other players in different modes: Deathmatch, Team Deathmatch, Capture the Flag, Control Points, Zombie mode. Balanced maps of appropriate size for different game styles: for snipers and for those who like close combat shooting. Exciting Zombie mode: kill all zombies or become a Zombie boss to infect other players! Leagues: earn the world ranking among the top shooters and get combat bonuses. Create your own strike squad and show your force to gain your place in overall Top. Lead clan wars to show everyone how skilled your team is. Each league will give you armor and damage bonuses.